It's always a little tricky when you watch the movie version of a book before reading the book. You end up having the actors, sets and other aspects of the movie in mind when you read the book instead of just letting your imagination run free and give shape to the characters in your own unique way. I'll always find this experience somehow limiting or that it somehow potentially risks tainting your experience with the book. This second book was part of the 2004 movie adaptation, which covered the first three books in this 13-title series in a single movie. I had always felt that this story had gotten the least screen time, or least that's how it seemed at the time. It's never easy to adapt three full titles into a single movie, especially for one geared towards children. So it's only natural for aspects to be lost or omitted in the final work cut. So how did I feel after finally reading the book in light of how it had been presented in the movie? Well, I can see what had been lost or shortened, and surprisingly it wasn't all that much. If anything, it does go to show how limited the book actually was, but it doesn't necessarily mean that this was a bad story on the whole. 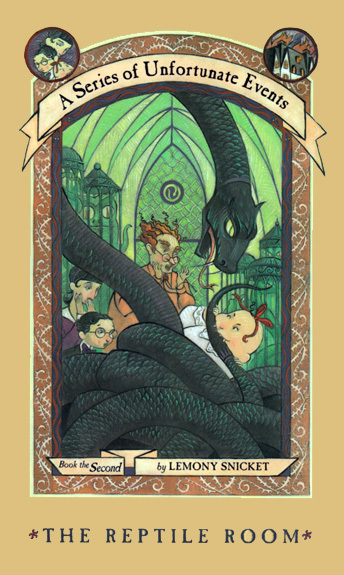 The Reptile Room is the second book in the Lemony Snicket (the pen name of Daniel Handler) series of books entitled A Series of Unfortunate Events. After the disturbing events in the first book, the Baudelaire orphans are back in the care of Mr. Poe, the legal executor of the estate. He now entrusts them to a new guardian - the herptologist Dr. Montgomery Montgomery. His lifelong obsession with snakes has resulted in his very home being designed to support the study of these creatures, especially with the glass-walled "Reptile Room" where he stores his collection of reptiles, mainly various snakes. But despite his somewhat dangerous passion, he's a very kindly man who manages to give the children some very real hope for the future. The big plan for now is to get ready for an expedition to Peru, where Uncle Monty hopes to discover new species of reptiles and other fascinating things. Thus he's set the children to task for preparing for the trip with Violet studying and inventing possible snake traps, Klaus is research on the various snake species and about the dangers of Peru in general while baby Sunny is to cut up rope with her amazing biting abilities. And Uncle Monty could use all the help that he can get since he assistant appears to have taken ill and his replacement, one Mr. Stephano, is still on his way over. The book starts by giving us a much happier tone to things as compared to the prior title where they suffered and toiled under Count Olaf. From their first meal of coconut cream cake to how Uncle Monty enjoys sharing his passion for snakes and other reptiles, it does all seem like the orphans may have finally found a happy home. But of course we know things are going to go bad and naturally the Lemony Snicket narrator persona continually reminds us of this fact all throughout the book. I did appreciate how the narrator took more time to actually talk to the reader compared to before. In the past our interactions with the narrator were limited to word definitions (which still happens a lot in this book like a sort of running gag). But in this book he spends more time to talk to us, apologize for needing to step away during particularly critical moments and other little touches. And I think this adds a nice tone to things and certainly enriches the overall "color" of the book. This title clearly sets up the overall pattern of the series, when you think about it. You start with the orphans meeting their new guardian. Then they start to adjust to their new life as they try to find their happiness. And then in the end they face new dangers and challenges. 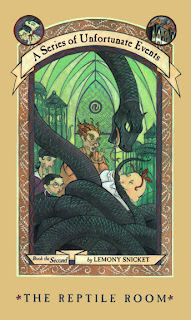 The Reptile Room is still an enjoyable book, but still not quite as strong as the first one. Or maybe I just felt it needed more plot development more than anything else. Still, it gets a decent 3 instances of The Incredibly Deadly Viper surprising us all out of a possible 5.